A friend of mine, an Oxford-educated mathematician, had a smart strategy to succeed in university. When two or more of her professors scheduled exams for the same week, she would immediately ask the instructors to clarify to what extent these exams would influence the final class grade. If the exam in one class was worth, say, 25 per cent of the final grade, and the exam in the other class was worth 50 per cent of the final grade, she would spend significantly more of her efforts studying for the second class. This seems logical and self-evident. And yet, I’m a bit ashamed to say, the relative weighting of exams was the last thing on my mind when I was a student. Presented with two exams, I’d either study equally for both or study much more for the subject I found more difficult, even if that subject’s exam was only worth 10 per cent of the final grade. Had I been as smart as my math-whiz friend, I would have largely ignored the 10 per cent exam and focused on the big fish. After all, if you can get 100 per cent on a preliminary exam worth 50 per cent of the final grade, you can pretty much ignore this subject going forward and sleep soundly knowing you’ll pass the course. 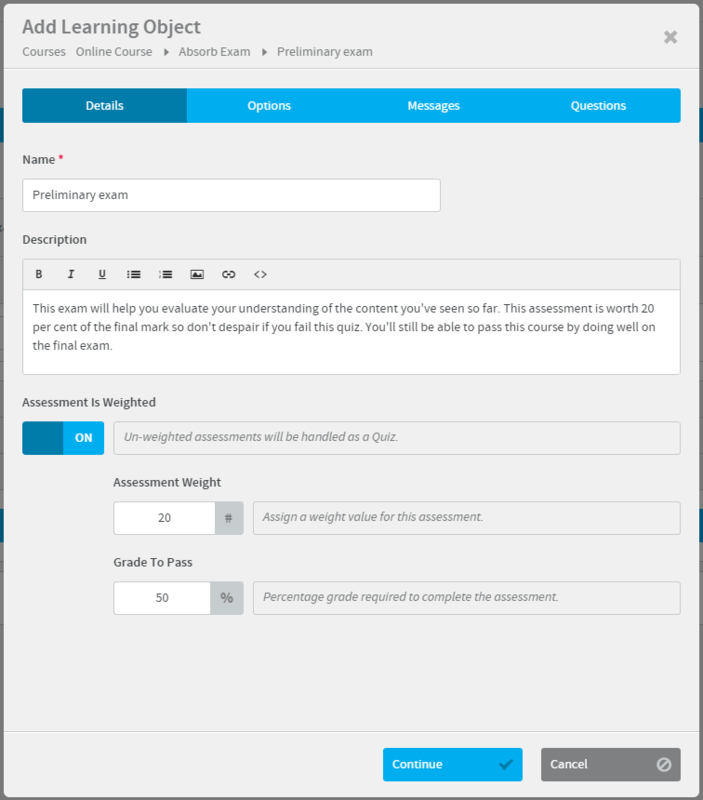 Assessments are an important part of learning and development strategies. Exams, of course, measure knowledge and retention and help establish whether a person is qualified to do a job or attain some type of accreditation. Since we tend to overestimate our own knowledge of a subject, exams also provide an important feedback mechanism. An exam can be a wake-up call, telling us we aren’t the experts we think we are. Exams designed to provide this type of reality-check feedback really shouldn’t count for as much of the final mark as an exam designed to measure overall knowledge of the learning content. Consequently, learning strategies can benefit from providing exams with different weightings. A course, for instance, might contain a preliminary exam worth 20 per cent of the final grade, and a final exam worth 80 per cent. Did you fail the first exam? Don’t despair! You can still pass the course if you stop goofing off and get a decent mark on the final exam. If you implement this strategy, be prepared to discover a few really smart students, like my math-whiz friend, who do poorly on the first exam and ace the second one.